Trained in the Tibetan Medical Astrological Institute of H.H. the Dalai Lama in Dharamasala, India,Dr. Jhampa Kalsang is among the first of the few practitioners to bring traditional Tibetan Astrology to the West. 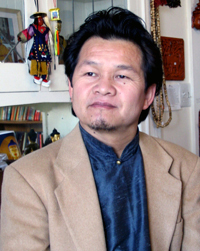 As a senior lecturer at the Tibetan Medical and Astrological Institute, Dr. Kalsang has travelled extensively throughout the United States and Europe. He is fluent in English and has a near-native understanding of Western culture. Dr. Kalsang is author of "Tibetan Astronomy and Astrology," as well as the recently published "Tibetan Astro Science" - a how-to book for lay people seeking a deeper understanding of the principles of Tibetan astrology and how to apply them to daily life. Dr. Kalsang has a private practice based in San Diego, CA at the Tibet Gift House, and offers workshops and other classes.